Each Apple iPhone will generate nearly a 50% gross margin for Apple and partner AT&T Wireless, giving the companies plenty of room for future price cuts in the competitive market where 835 models of music phones expected this year, according to a preliminary estimate by iSuppli Corp.
Apple enjoyed over 45% margins in its other successful products including the iMac and iPod nano, according to iSuppli. However, because Apple is facing extensive competition in the music-phone market, the company may need to cut into its margins to reduce pricing in the future. In the high growth and competitive music phones market, some 835 new models are expected to be introduced by various competitors in 2007. In terms of features and form factors, the closest competitor to the Apple iPhone is LG’s KE850, which will ship later this year, says iSuppli. 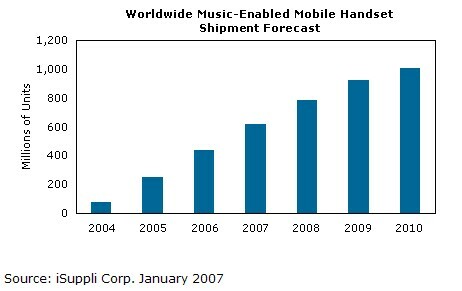 Shipments of music-enabled mobile phones will rise 39.9% to 618.1 million units in 2007, up from 441.7 million units in 2006, iSuppli predicts. By 2010, shipments of such phones will increase to 1 billion units. Apple’s goal is to capture 1% of these unit sales, which seems attainable, according to iSuppli.